Nitro cold brew is big—like, really big. “Nitro” refers to coffee that has been infused with nitrogen. Unlike regular carbonation, nitrogen creates small air bubbles that keep their shape longer and give the coffee a heavy, silky texture. Think of the difference between any ol’ beer and a Guinness. When you infuse coffee with nitrogen, the coffee takes on a very similar texture and mouthfeel. However, unlike Guinness, which is delivered to your favorite bar ready to pull from a keg tap, most coffee shops make their cold-brew coffee on-site, and having a nitrogen keg can be incredibly cost-prohibitive and wasteful. You have to ask yourself, how many of these am I going to sell in order to justify the cost of not just a keg, but the dedicated tap space? If only you could make nitro cold-brew to order, right? You can see the cold brew beginning to cascade, just like a Guinness. Mark Kim, owner of Amis Creperie and Café in South San Francisco, asked himself that very question, and then one day, he found the solution. He was researching different beer-dispensing technologies when he discovered NitroBrew, a handheld device that nitrogenates anything you put into it. The NitroBrew looks like sort of like a hot glue gun fused with a moka pot—you open up the bottom portion that has a container for liquid, put whatever you’d like into it (coffee, of course, would be our choice), close it up, and place a nozzle into a charging station, and then pour your drink out of the nozzle. The NitroBrew has an interior chamber for liquid—coffee, beer, tea, etc. 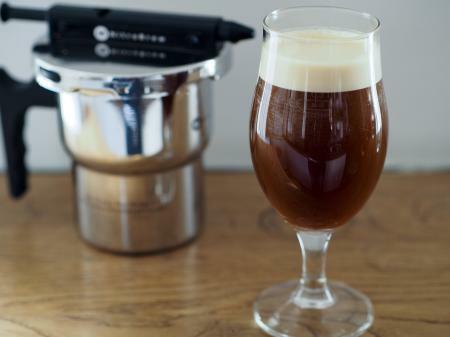 After a quick charge, the NitroBrew dispenses smooth, nitro-infused beverages. Along with preventing waste since it allows you to make one cup at a time, the NitroBrew is also an inexpensive way to introduce nitro coffee to your customers. “Since the cost of the system was so low—especially in comparison to a fully kegged system, which was turning out to be prohibitively expensive—I thought it was worth a try, and if it didn’t work as advertised, I could just call it a loss,” Mark says. You can loosely compare the NitroBrew-vs.-keg argument to the pourover-vs.-batch brew. The benefits of the first ones—NitroBrew and pourover—include allowing you to customize and offer a wider, fresher selection. And challenges? A little extra time to prepare, and some explanation for customers who might ask about this new preparation method. Not too big a deal, when you think about it. Sonja Zweidick, who graced the cover of the June+July 2016 issue of Barista Magazine, was an early adopter of the NitroBrew. Regardless, the NitroBrew allows for experimentation and play, and it delivers a solid nitro coffee that might have been unavailable to many coffee shop owners previously, and it’s a fun way to add a new drink to your menu and be creative with how coffee can be served.